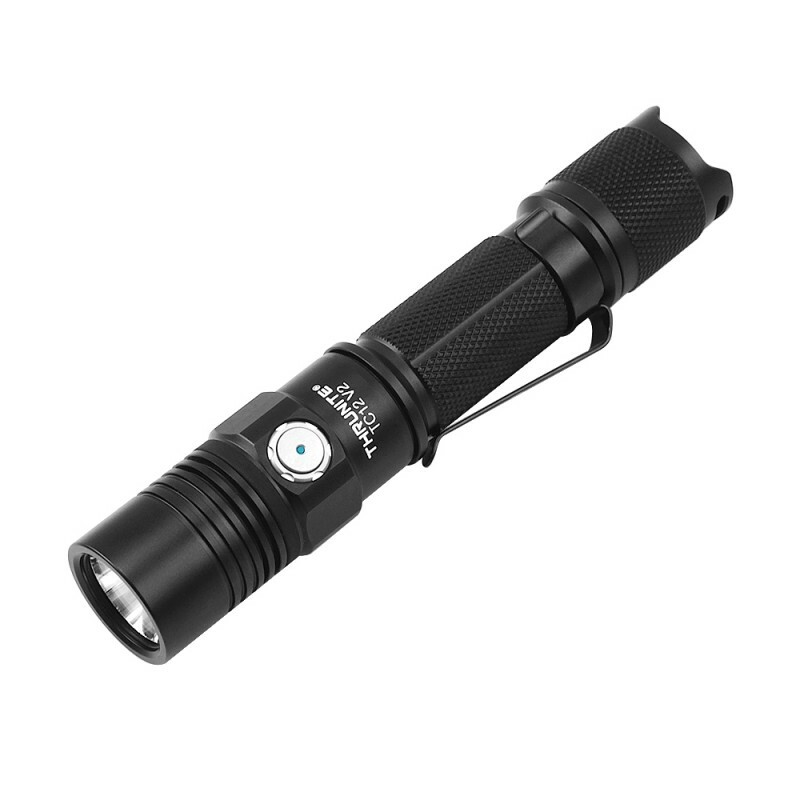 Micro USB Rechargeable EDC LED flashlight with intelligent overcharge protection. Adopt latest CREE XP-L V6 LED to make max output up to 1100 lumens. Adopt common micro USB charging port for easy use everywhere. Stainless steel side switch makes the operation more sensitive and convenient. Six modes for available: Firefly, Low, Medium, High, Turbo and Strobe. Silent Momentary-on “forward clicky” tactical tail switch for signaling or brief lighting. One key to Strobe for signaling or blinding the bad guys’ eyes, TC12 is more than an EDC. ThruNite ITC(intelligent temperature control) technology to prevent possible light damage from overheating. Smooth reflector for far beam in search, hunting, law enforcement and military applications. Memory function to set any mode (except Strobe) for immediate use. More compact than other rechargeable LED flashlights on the market. Runs on: 1x18650 battery (included). Power interface: 1 * micro USB charging port. Dimensions: 140mm (length) x 25.4mm (body diameter). 18650 3400mAh Battery x1, USB Charging Cord x1. Press the tail switch halfway to momentarily ACTIVATE the light. Click the tail switch to turn the light on and off. With the light turns on, press the side switch to circle through five different mode outputs from Firefly, Low, Medium, High, and Turbo. and a single press the side switch will return to the last mode before Strobe. while awake from sleep, or just reading in its natural beam to protect the eyes at night. Firefly mode is what ThruNite keeps doing to be considerate for every user, tactical or normal. The light will automatically lower the current when temperature in LED or driver rises to 80 degrees centigrade to protect the flashlight from overheating. Thus to extend its lifespan. Please turn on the flashlight and keep the battery inside to charge. The light indicator cycles through red, yellow, green while charging. Battery capacity: >20%, Green light will be ON. Battery capacity: <10%, Red light will flash and remind to be charged. After being fully charged, Green light will be ON. Note: the battery capacity indicator will not work at Firefly mode.